The conference program will include paper presentations and poster sessions. Authors are asked to suggest the preferred form of presentation while the Program Committee will make the final decision. All submitted papers will be reviewed by leading expert in the field covered by the conference topics. There will be an accompanying exhibition during the conference. A two-page structured abstract (A4, double column, 10 pt – see the template) for each paper should be submitted through the Conference Management System. It shall contain the title of the paper, author’s names and affiliation, the main contents of the paper (related work, general methodology, results, conclusion) and references. Here you can download the Extended Abstract template (DOC, Microsoft Word, A4). Each abstract will be reviewed by two reviewers. If accepted the authors will be asked to upload the full paper. Full paper describing work not previously published or presented must strictly conform to the conference format. The full paper length should be between four and six pages. Authors should upload their papers through the Conference Management System. Papers which are not submitted through the Conference Management System or do not conform to the conference format will not be further processed! Here you can download the IEEE full paper template (DOC, Microsoft Word, A4). IEEE conference templates contain guidance text for composing and formatting conference papers. Please ensure that all template text is removed from your conference paper prior to submission to the conference. Failure to remove template text from your paper will result in your paper not being published. IMPORTANT! All authors shall add the copyright notice (info) to their papers before creating PDFs. The appropriate copyright clearance code notice is to appear on the bottom of the first page (First Page Footer -Section1-) of each paper according to the guidelines set forth in the Cataloging/Copyright Instructions for an IEEE Conference Proceeding. In order to be included in the IEEE Xplore® Digital Library authors shall convert a paper to a PDF and verify that they have IEEE Xplore-compatible versions of their manuscripts. 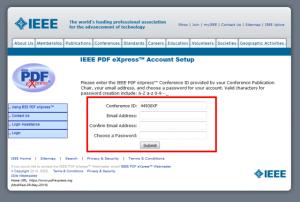 Authors could use the IEEE PDF eXpress Plus™, which is a free service to IEEE conferences, allowing them to validate their papers for meeting IEEE Xplore® requirements. If there is a formatting issue, it will identify the problem for the author so it can be fixed. Access the Publications Support Center for IEEE PDF eXpress™. If you do not find an answer in the Find Answers tab, go to the Submit A Question tab. Your question will be forwarded to IEEE PDF Support and answered within 3 business days. IEEE PDF eXpress™ is not a manuscript-collection system and does not replace the conference’s submission system. Once authors verify that they have IEEE Xplore-compatible versions of their manuscripts, they will still need to upload the files to the Conference Management System. Please, upload the full paper in both .docx (.doc) and IEEE Xplore-compatible .pdf formats packed together as a ZIP archive file to the Conference Management System. A full paper (the ZIP file), signed copyright-form and a proof of registration fee payment have to be electronically submitted separately through the BalkanLight 2018 Conference Management System no later than the deadline (September 10, 2018). Papers not formatted according to the above templates and/or are not submitted by the deadline will not be included in the proceedings. The paper should be reported personally by one of the authors. For the oral presentations it is recommended MS PowerPoint to be used. IEEE is the copyright holder of the Conference Proceedings. All accepted papers will be published in the Conference Proceedings and submitted to the IEEE Xplore® Digital Library for distribution in scientific databases. IEEE reserves the right to exclude a paper from distribution after the conference, including IEEE Xplore® Digital Library, if the paper is not presented by the author at the conference. Here you can download the IEEE Copyright Form. The IEEE copyright form (one for each paper) must be filled and signed. Print the form, fill it in and sign it. You need to fill in the title of paper, list of authors and IEEE Publication Title. For the IEEE Publication Title please use the following sequence of words: 2018 Seventh Balkan Conference on Lighting (BalkanLight). Scan the signed copyright form. Both full paper and copyright form must be converted in PDF file format. IEEE is very strict about the requirements for converting application files to full-text PDF in order to be included in IEEE Xplore®. 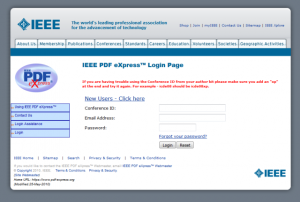 Please use the IEEE PDF eXpress Plus site to validate your paper (described above). IEEE requires all publications to be submitted to a plagiarism detection process prior to being uploaded to IEEE Xplore® to ensure originality of the content. The authors will receive the IEEE CrossCheck results (if the similarity percentage is under 30%, the Result is “OK”. If not, it is “Review Report”).